Situated in the core of a reserved forest and spread in the area of 1727 sq. km, Tadoba National Park lies in the Chandrapur district of Maharashtra (India). 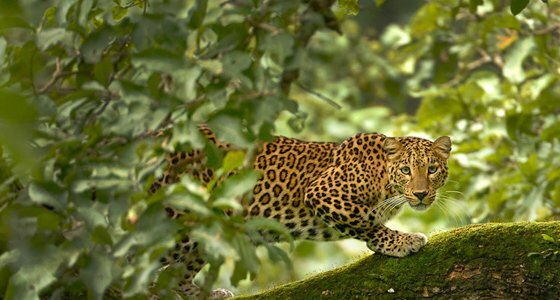 One of the largest and oldest national park, which has endless treasure trove of large number of species of trees & plants and wildlife like panthers, tigers, hyenas, sloth bears, wild dogs, jackals, barking deer, bison, sambar, herd of deer to name a few. Overshadowed by teak & bamboo, and with a magical landscape of rugged cliffs, marshlands, lakes, etc., it's full of unlike flora and fauna, which was once privileged by shikaras (hunters). 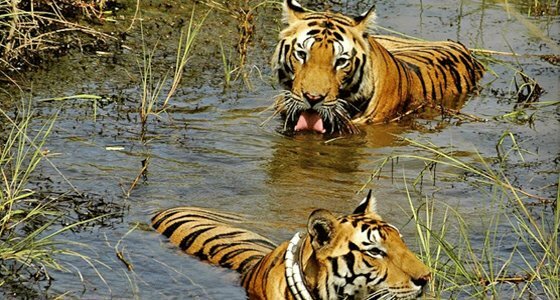 There is a great history behind the name of Tadoba National Park. Tadoba or Taru was the name of god of tribal people who reside in the dense Tadoba region of the forest. It is believed that Taru was a chief of village, who was killed in a legendary encounter with a tiger. After this, a shrine was made dedicated to the God Taru that exists under a huge tree and on the bank of Tadoba Lake. Likewise, ‘Andhari’ name was given due to Andhari River that wanders through the forest. Earlier, the kings of Gond ruled this forest in the vicinage of the Chimur hills. During 1935, hunting was totally restricted, but later in the year 1955; the area of 116.54 sq. km (45.00 sq mi) was acknowledged as The National Park. Andhari Wildlife Sanctuary was made on the next forests in 1986 and later in the year 1995, the park & the sanctuary were combined together to form the present India’s 41 “Project Tiger”-Tiger Reserves. In addition, Axlewood Anogeissus Latifolia is also found here that is fire-resistant species, while on the other side, Butea monosperma adds vivacious color to this forest. Arjun trees are also found at Panchadhara. 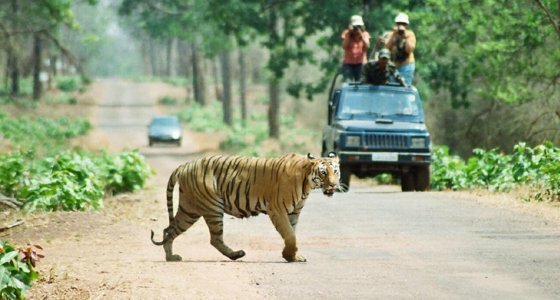 Tadoba National Park is a popular tiger reserve that’s affably known as ‘The Land of Tigers’ as large number of tigers (approx.43) are found here. Apart from the species of Bengal Tiger, this park is home to other mammals like Sloth Bear, Leopard, Rusty Spotted Cat, Gaur (Indian Bison), Indian Mouse Deer, Ratel, Sambar, Wild Pig, Spotted Deer, Flying Squirrel, Four Horned Antelope, to name a few. As soon the night falls, the Small Indian Civet, the Palm Civet, the Ratel, and the Flying squirrel make their presence felt. Above all, there are approx 195 species of birds that include honey buzzard, crested serpent eagle, the shy jungle fowl, grey-headed fishing eagle, paradise flycatcher, etc. Species of reptiles are also found in this park like endangered Indian python, terrapins, star tortoise, cobra, etc. Apart from this, giant wood spider, the signature spider, and red wood spiders are also found during monsoon season. Tadoba National Park is enclosed by some beautiful places and temples like Tadoba Lake, Sankatmochan Hanuman Mandir, Shiv Mandir, and Urjanagar Lake. Visit the oldest national park of Madhya Pradesh and get an opportunity to view the striped creature at Tadoba National Park. Apart from this, there are some popular tourist attractions that are in close proximity from the national park like St. Michael Church, Durga Maa Temple and Ayyappa Temple. Other than this, Nagpur is very close from the park that is also known as ‘Tiger Capital of India’ as it is linked with many tiger reserves in India. This park gives a large visual treat of wildlife, especially while getting a chance to spot tigers. To view the real wildlife, the best time to visit is from February to May. During this time, Gaurs, tigers, herd of deer and other animals are easily seen in large numbers. Exploring these animals give thrilling experience and big treat to a trip. 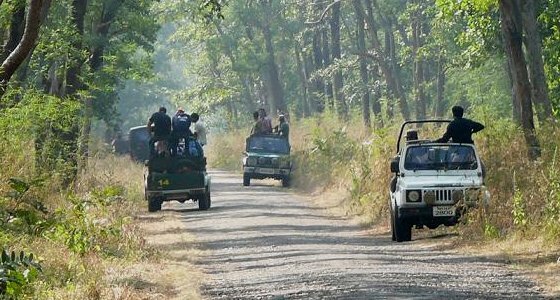 Gypsy and Jeep Safaris are always available in Tadoba National Park that help in exploring the wildlife of the forest. For budget options, Maharastra Tourism Development Corporation hotel (Mohrali) and the Forest Development Corporation of Maharashtra guesthouse and dormitory room are also perfect for comfy accommodation. Apart from this, Eco huts provided by the Forest Development Corporation of Maharashtra are also good for those who are looking for budget lodging in Tadoba National Park. By Air-Nagpur (140 Km) is the nearest airport from where it takes 3 hour taxi rides to reach the park. By Rail-Chandrapur (49 kms) and Nagpur (151kms) are nearest railheads. By Road-Nearest bus stop is Chandrapur and Chimur (32 km), but bus or cabs are also available from Chandrapur to Mohrali Village.